Rapper Eminem has been accused of writing and recording racist lyrics in his teens, after a taped rap denigrating black women was unearthed. The white rap star, who has sold millions of albums, admitted he wrote the lyrics in 1988, the New York Times reported on Tuesday. The tape was given to influential US hip-hop magazine The Source. 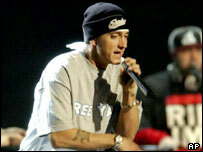 Eminem apologised for the lyrics, saying they were "foolishness" written when he was a "stupid kid". On the tape, Eminem sings about his unhappy experience with a black girlfriend and warns about dating black women. Raymond Scott, co-owner of The Source, said the lyric suggested that "black women are bad and white women are good". "I don't care if he's redeemed himself now, that's not the message," he said. "If that's who he is then he has to be held accountable for that." In a statement released on Tuesday, Eminem said he had made the tape "out of anger, stupidity and frustration when I was a teenager". "I'd just broken up with my girlfriend, who was African-American, and I reacted like the angry, stupid kid I was. I hope people will take it for the foolishness that it was, not for what somebody is trying to make it into today." Eminem said the row was the result of an ongoing feud with Mr Scott, who raps under the name Benzino. In a separate tune of Eminem's, Nail in the Coffin, Eminem calls Mr Scott "the softest fakest wannabe gangster in New York". Mr Scott, in a song called Die Another Day, labels Eminem " the rap Hitler" and "the culture stealer". 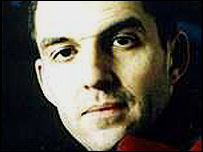 BBC Radio 1 hip-hop DJ Tim Westwood said it was "crazy" to brand Eminem racist. He said the spat was inspired by rivalry among hip-hop magazines. "I think you have got to understand it in its context. I don't think you can judge a man by some madness at the age of 10," he told BBC Radio 5 Live.